I said it in January when he went out with a foot injury, and i am saying it now, Duke is a Championship team with Ryan Kelly on the court. How do you not step on the court for eight weeks and score 36 points against a top 5 team? It is one of the best comebacks I have seen the past 10 years. Lets not forget some other things that went right for the Blue Devils tonight. Mason Plumlee rendered Reggie Johnson ineffective. Reggie got into foul trouble early in the game, forced by the physical play of Plumlee. Seth Curry and Rasheed Sulimon had mediocre nights, both scoring in double figures but certainly not playing dominate Duke basketball. Quinn Cook, on the other hand, played well and distributed the ball well to his teammates. Imagine what could have been if Curry or Sulimon had been on tonight from behind the arc, or, God forbid, both of them. Tonight, Cameron Indoor sounded like Cameron Indoor, the fans were loud and obnoxious. Every time Duke touched the ball, the Crazies went nuts, and every time Ryan Kelly scored, the roof must have been in danger of coming off of the building. Mark my words, Duke is now the team to beat in March. 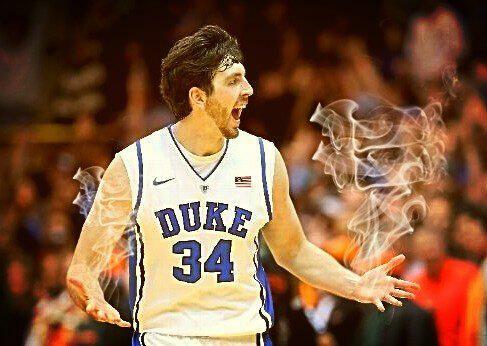 Ryan Kelly is the missing part to this Duke team, with him back they are poised for a deep run into the NCAA Tournament. The wind is at the Blue Devils back, they have the momentum heading into ACC Tournament in two weeks. This is a turning point in the season, lets see what Coach K can do with this dangerous Duke team.